Due to a bit of wet weather last week and the start of the two day comp, we apologise for not bringing you a weekend wrap. To make up for it let’s go with a fortnightly wrap. 1st – 4th kicked off their 2-day campaign against Tuggeranong with mixed results. 1s managed a hefty total with many contributors but unfortunately Tuggeranong made the target 9 down. 2s had lost the first day to wet weather but started well on day 2 declaring with 275, however a few missed chances meant they had to settle for a draw. 4s managed to make a meagre total batting first at Aranda look like a mammoth effort by bowling Tuggeranong out for 50. Our Women’s team had a split result with a big win over Norths the first week and pretty serious defeat however they still sit 4th on the ladder and are hopeful of making an impact in the Glenda Hall Shield Finals. 5th Grade were washed out on week one of fixtures against Ginninderra, which would have been a nice check to see how they are travelling. They followed up the second week with an emphatic victory at Kaleen bowling the opposition out for double figures. 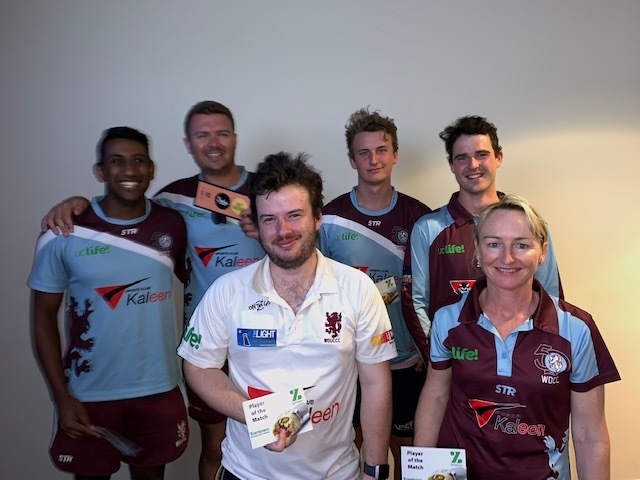 On week one of fixtures those who were washed out took the opportunity to get to Chisholm and Kaleen to watch the playing teams meaning that there was a good crowd of Westies clapping those first graders who brought up milestones with the bat. After the second week numbers at the Kaleen Sports Club for a few beverages and chicken chippies and awards. Next weekend is a big one with 1st-4th grade playing QBN and our ‘Day at the Ballpark’ event on the Sunday, it looks to be a fairly involved weekend.